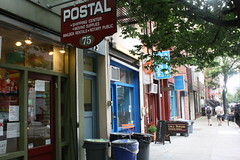 Sarah Darville Postal and other businesses on East Fourth. Store owners already struggling to get by are worried about a significant rent increase planned by their landlord, the Cooper Square Mutual Housing Association. The Local spoke to about a half dozen shopkeepers on Third and Fourth Streets, between Bowery and Second Avenue, who said they were grappling with a sluggish economy as well as challenges unique to their blocks. Some worried they would follow in the footsteps of La Sirena, which earlier this week announced that it would be closing, should they too face rent hikes of what is expected to be around 30 percent.